3,000 B.C. to 750 B.C. The Peloponnesus Peninsula (Home to Sparta, Olympia, and Argos). Isthmus of Corinth (Connects Attica to Peloponnesus). Boeotia (Home to Thebes and Delphi). Thessaly (Grassland famous for its horses). Macedonia (Rough, rugged, mountainous, and cold. Home to Alexander the Great). Thrace (Northeast of Macedonia. Home to semi-Greek, barbaric people). Hellespont (Thin strip of water that separated Thrace from Asia Minor. Now called the Dardanelles). Asia Minor (Now know as Turkey. Ionian Greeks settled the coast of Asia Minor). Mainland Greece is divided by short but rugged mountain ranges. Greek rivers are shallow. The soil is rocky and poor. The coastline is irregular with many excellent harbors. Greeks became a sea-faring people due to the closeness of the sea. Merchants and traders developed a sense of independence from their ability to leave and sail the seas. The climate is mostly moderate. 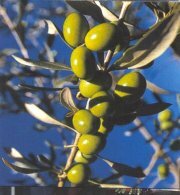 Greeks resorted to growing plants that didn’t need much water – dates, olives, and some fruits. The inability to grow much food forced Greeks to rely on sea-trade to feed their populations. The mountainous regions of Greece isolated its peoples. Isolated peoples developed fiercely independent city-states. While people identified themselves as Greeks, their loyalties were to their Polis (city-state). They saw other Greeks as foreigners to their Polis. Sapere Aude! What effect does geography have on a society’s culture? Minoan society lived on the Island of Crete, south of Greece. The civilization was named after the royal family, Minos, and the Minoan kings were supposedly fabulously wealthy. Minoans seemed to be a happy, peaceful people. Their kings were said to be very wealthy, and the general population was middle class. They had a complex economy, and traded with the great empires of the time (Hittites, Egyptians, etc.). They wrote in a language we call Linear A. We have not fully deciphered Linear A. 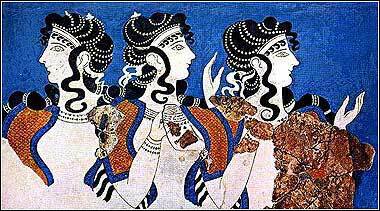 Based on Minoan artwork, it appears women had important roles. They had a religion based on the Bull. They lived in comfortable buildings with indoor showers and flush toilets! The palace at Knossos consisted of rooms placed in a maze-like pattern around the palace. Around 1630 B.C. the island of Thera (150 miles north of Crete) exploded. An enormous volcano existed there. It was the largest volcanic eruption recorded in history. The blast instantly vaporized 50 cubic miles of rock and created a tremendous tidal wave. This tidal wave hit Crete. Following the wave, a hot cloud traveling hundreds of miles an hour, burned through Crete, leaving much of the land in flames. Mycenaeans were mainland Greeks. They were highly influenced by the Minoan civilization, and created a written language based on the Minoan Linear A. The Mycenaean written language is called Linear B. Modern scholars can read Linear B. They too lived in cities, but of poorer quality when compared with Minoan Knossos. Developed a sophisticated Bronze Age civilization. This means most of their tools and weapons were made of bronze (a mixture of copper and tin). Mycenaeans were war-like. Polis often fought Polis. Pirating the seas was common. Peaceful trade did occur, but a lot Mycenaean wealth was from war booty. Society was based around a strong king. Society was male-dominated. Women were used for making textiles. Mycenaeans did not have religious shrines. B. The Trojan War 1194 B.C – 1184 B.C. Much of this war is based in myth, but it is likely some large conflict/rivalry existed between the Mycenaeans and the Trojans. We know about these wars from Homer’s epic poems, The Iliad and The Odyssey. The Iliad is about the war itself. The Odyssey is about the Mycenaean king, Odysseus, and his struggle to get home to Ithaca. In The Iliad, Menelaus, brother of Agamemnon, seeks revenge for Prince Paris’s abduction of Helen (Menelaus’s wife). Paris takes Helen back to Troy. Agamemnon gathers the strongest and bravest warriors to fight against the Trojans, who live off the Ionian coast near the Hellespont (coast of modern day Turkey near the Dardanelles). The war lasts 10 years, and centers on a feud between Agamemnon and Achilles. They fight over women slaves. Achilles sulks and refuses to fight. He is the Greeks’ greatest fighter, and things go badly for them. Then, the tide turns in favor for the Greeks. Hector (the greatest Trojan fighter) kills Achilles’s best friend, Patroclus. Achilles kills Hector in revenge, and things start to go better for the Greeks. Still, the Greeks can’t beat the Trojans, and even Achilles gets killed from a fatal wound to the ankle. It takes the great mind of Odysseus, king of Ithaca, to find a way to beat the Trojans. Odysseus has a huge wooden horse built (called the Trojan Horse). The Greek ships pretend to sail away. 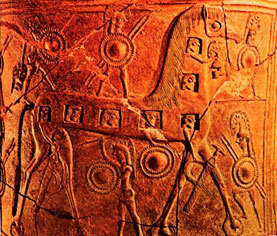 Inside the horse are Odysseus and his men. The Trojans take the great horse as a gift of defeat, and gleefully take the horse within the huge walls of Troy. That night, after the Trojans have drunk too much and passed out in a deep slumber, Odysseus and his men come out of the horse and open the gates. The Greek army had already returned and rushed into the city. The Trojans were massacred, and the Greeks finally won the war. In The Odyssey, Odysseus and his men sail back for Ithaca. However, Odysseus angered the sea god, Poseidon, with his Hubris (excessive pride) and curses Odysseus to wander many years before reaching home. He faces a Cyclops, witches, and the wrath of angry gods. He comes home to find his reluctant wife about to remarry. In a fury, Odysseus slaughters all the suitors with the help of his son. The Iliad and The Odyssey become the guidebooks for Greeks on how to be Greek. C. The Dorians and the Greek Dark Ages 1,150 – 750 B.C. Around 1,184 B.C. Dorian Greeks from the north swept down and destroyed Mycenaean civilization. A Dark Age ensued whereby little progress in the Arts and learning were made. Surviving Mycenaeans sought shelter around hilltops and built walls around a center area called an acropolis. Around this time Athens and Sparta are established as major cities. After 750 B.C. 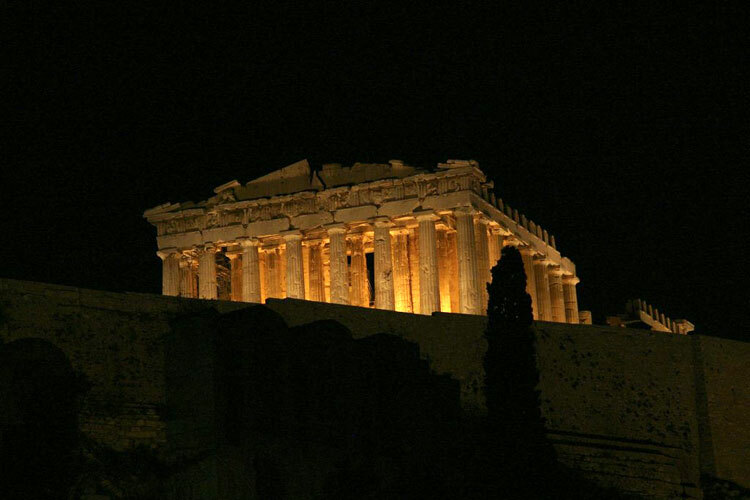 the Greeks entered an Archaic period where they begin to recover the Arts, learning and culture. This gave rise to the Classical Age of Greece. Warfare and the Classical Age 490-338 B.C. A. By 500 B.C. the Persian Empire had conquered all of the Fertile Crescent (Mesopotamia) and Asia Minor (modern day Turkey). Ionian Greek city-states (on the coast of modern day Turkey) revolted against the Persian Empire in 499 B.C. Ionian Greeks sought help from mainland Greeks. Aristagoras, an Ionian Greek, sent ambassadors to Greece for help. Athens was one of the few city-states to send aide. The Persian naval fleet encountered the Athenian fleet and was defeated. Darius I of Persia was interested in the wealthy trade Athens controlled. He declared war on Athens and its allies in 492 B.C. He sent a large navy straight for Athens, but it was destroyed by a storm in the Aegean Sea. Darius I then decided to regroup and gather his forces. The First Persian War 491-490 B.C. In 490 B.C., Darius I conquered Thrace (a semi-barbaric, Greek-like land located northeast of Macedonia), in an effort to smash his way toward Greece. He sent an emissary to the various Greek city-states with the message that all Greeks should send him a jar of earth and a jar of water to show that the Greeks recognized Darius I as the ruler of their lands and seas. Characteristically, the Spartans threw the emissary down a well, saying he could have both at the same time. Darius I responded by sending his huge navy, carrying a massive army, across the Aegean to land his troops to start the land war. His goal was to conquer Athens first, then subdue the other arrogant city-states. His troops landed at Marathon, just north of Athens. The remaining Persian force tried to get around Marathon and headed for Athens. Luckily for the Athenians, they had the runner, Pheidippedes, who ran 26 miles to Athens to warn them of the approaching Persian force. The Athenians fought the invaders back, and Darius’ army was forced to return to Persia, defeated and embarrassed. The Second Persian War 480-479 B.C. After his father Darius I died in 486 B.C., Xerxes swore to take revenge on all Greece, but especially the Athenians. For six years he gathered an army of monstrous size to destroy the Greeks. For one of the few times in Greek history, Athens and Sparta, along with their respective Greek allies, united to defend themselves against the Persians. The Spartan king, Leonidas, led a small army of 300 Spartans and roughly 7,000 allied troops to defend the pass at Thermopylae. The 300, as they are popularly called, was an all sire unit. Meaning, each Spartan warrior had at least one male child to carry on the family name should he be killed. These Spartans were going on a suicide mission. Thermopylae, also known as the Hot Gates because of nearby hot springs, was the entrance from Thessaly to Greece in the north. Leonidas and his men stalled the massive Persian force (Herodotus said 2 million men) from entering Greece while the remaining Greek forces retreated to further prepare for the Persian invasion. Meanwhile, the Athenian general, Themistocles, ordered the evacuation of women and children of Athens while the Athenian men went to their awaiting warships. The Athenians decided to stake their survival on their powerful navy. While Leonidas was fighting at Thermopylae, Themistocles and the allied navy were engaging Xerxes’s navy nearby. The Persians were mostly unopposed in Boeotia and Attica. They burned most of Athens to the ground. The Greeks were uncertain what to do. Themistocles came up with the solution. He sent a false message to Xerxes, stating that the Greek fleet was considering fleeing from its position around the island of Salamis. Xerxes jumped at the news and sent the bulk of his fleet to destroy the allied Greek fleet. In September of 480 B.C., the Greek fleet, led by Themistocles and the Athenians, utterly defeated the Persian fleet at the Battle of Salamis. The Persian fleet was a fighting force, but also the Persian army’s main supply line. Without it, the Persian army was in serious trouble. The Battle of Salamis turning the tide of the war in favor of the Greeks. Xerxes left Greece disgusted, taking a large portion of the army. He left his general, Mardonius, and the remaining Persian army to defeat the Greeks. The Greeks, led by Sparta, defeated Mardonius’s army at the Battle of Plataea in 479 B.C. The Persian Empire never invaded Greece again, but kept a strong hold over its territory until the invasions of Alexander the Great. The Peloponnesian Wars 431-404 B.C. A. Athens became the dominant power in Greece after the Persian Wars. It entered a Golden Age under the leadership of Pericles. Athens forms the Delian League – a coalition of Greek city-states whose purpose was for common defense and the liberation of Greeks under Persian control. In reality, Athens became the bully of the Delian League. It existed more for Athens than any other city-state. Once a city-state was in, Athens made sure it stayed in. Sparta and its allies were not a part of this league. Sparta resented Athenian power, and when their allies, the Thebans, got into a battle with Athens, Spartan jumped at the chance to fight the Athenians. Sparta was determined to crush Athens. The Peloponnesian Wars had begun. The Spartans eventually won the wars under the leadership of their naval general, Lysander, and with the backing of Persian gold. Basically, the Persians paid the expense of a naval fleet to be built for the Spartans. Sparta reinstated a tyrannical form of government in Athens. This didn’t last long. All of Greece was exhausted and weak from years of fighting. It was ripe for conquest by a strong leader. That leader would be King Philip II of Macedonia – father of Alexander the Great. The Classical Age 480-338 B.C. During the Classical Age, educated Greeks came to believe in the philosophy of Humanism. Humanism is the belief that humans are almost godlike-they can achieve anything. The philosopher, Protagoras, said, “Man is the measure of all things.” In other words, humans define the world. This was a time for art, literature and philosophy. 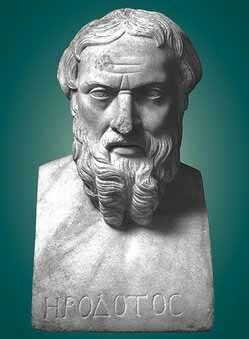 Herodotus is considered to be the first historian in the western world. He lived from 484 B.C. to 425 B.C. He is known for his history book called The Histories. In it, Herodotus wrote about early Greek, Egyptian, Mesopotamian and Persian history. Herodotus’s work centered greatly on the conflict between the Greeks and Persians. Because of his work, Herodotus is known as the Father of History. However, because Herodotus included rumor, myths, and used doubtful sources, he is also known as the Father of Lies. Thucydides is regarded as one of the first true historians. He lived from around 460 B.C. to 400 B.C. His history book is called the History of the Peloponnesian War. In it, Thucydides explored the reasons for the conflict between Athens and Sparta, and the reasons for Athens’ eventual downfall. Unlike Herodotus, Thucydides interviewed actual participants of the Peloponnesian War, used credible documents for research, and carefully checked his facts. Thucydides tried to collect his data in a scientific way, and present his findings without bias. Socrates was the inventor of the Socratic Method, a.k.a. the Socratic Dialogue. This was a way of conversing with a person(s) to discover truths. He believed one must examine everything in life to find what was actually true, versus what was a false idea accepted by people only because tradition said it was true. He questioned people on their commonly held beliefs only to make them discover that what they held to be true actually wasn’t. This often embarrassed and annoyed people. Powerful enemies brought charges against Socrates for corrupting the youth of Athens. So long as I draw breath and have my faculties, I shall never stop practicing philosophy and exhorting you and elucidating the truth for everyone that I meet. And know this gentlemen, whether you acquit me or not, you know I am not going to alter my conduct, not even if I have to die a hundred deaths. 3. Socrates didn’t care whether the jury disliked him or his methods. He knew his pursuit for truth was a noble one, and if he had to die for it, so be it. Socrates was found guilty and sentenced to drink poison hemlock. 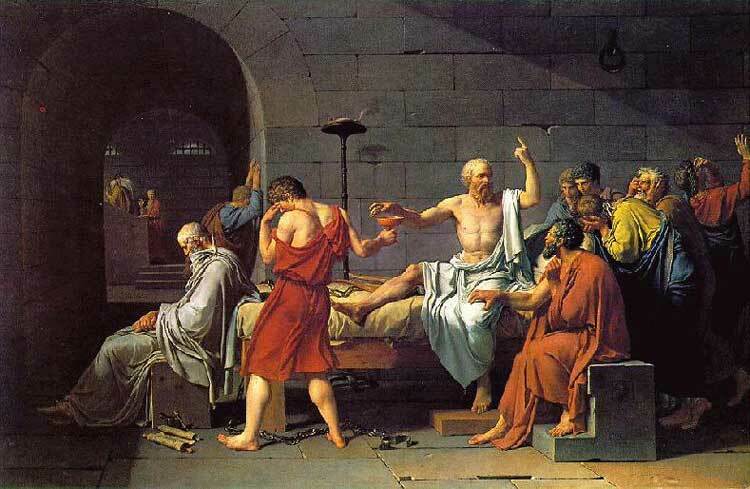 Even while awaiting his execution, Socrates could have escaped through the help of his friends. He refused. He preferred to die for what he thought was right. Today, Socrates is regarded as noble spirit – a man to be admired. Almost everything we know about Socrates comes from his pupils, especially Plato. Plato founded the Academy outside of Athens. It was built near a grove dedicated to the mythological hero, Academus. It was a school of philosophy. Plato disliked democracy. He blamed democracy for Socrates’ death. Plato felt a philosopher king should rule people, and only those philosophically trained should have power. He believed a philosopher king would be beyond the pride, jealousy, greed, etc., that tainted most leaders. He described his ideal society in his book called The Republic. 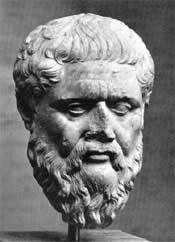 Included in The Republic were Plato’s philosophical ideas on reality. Plato believed our world was a combination of the realm of the senses (or that which we can perceive with our senses) and of the realm of ideas. So, let’s say you see a duck. You know it’s a duck, because it quacks, has feathers, walks like a duck, and eats what ducks eat. You know it’s a duck, because your senses tell you so. Senses weren’t enough for Plato. He wanted to know where the idea for a duck came from. When Johnny, Suzy, Little Joe, and Ricky Bobby see a duck, they all think, “duck” in their little heads. Where did they get this idea for a “duck”? What came first, the duck or the idea for a duck? Far out, dude! Plato’s solution was that there must be an “idea” realm that was part of our world. He said that our souls inhabited this realm of ideas before we were born. While living in the realm of ideas, our souls see the perfect examples (or molds) of everything we will see in the realm of the senses when we are born and live our lives. So, in the realm of ideas, our souls witness the perfect duck, the perfect cow, the perfect cheeseburger, etc. By the way, Plato thought our souls were immortal, and he believed in reincarnation – the belief that when a person dies, his/her soul will not die. Instead it will inhabit the new body of an infant at birth. That’s weird for a Greek. In The Republic, Plato wrote a short story called The Allegory of the Cave. An allegory is a story that is told to teach a certain concept. He said imagine there are a group of people who have been chained to the floor of an enormous cave since infancy. They cannot move their heads. They can only look forward. They can’t even see each other. Never mind going to the bathroom and stuff; it’s not important. Behind these people at the other side of the cave is a huge fire. Between the fire and the people, various things pass by. Perhaps a horse passes by, or other people, or-a duck. These people who are chained to the ground can only see the shadows of the horse, other people, duck, etc. These unfortunates think the shadows they see are reality. They all see the shadow of a horse and think, “horse.” The real horse just walked by, but they don’t know that. They are completely ignorant of reality. Plato contended that we actually live our lives like those people chained to the ground. Sure, we’re not actually chained, and we can move, but what we perceive with our senses isn’t real. We see cheap knock-offs that won’t last. They may be beautiful knock-offs, but knock-offs none the less. Only the molds for the cheap knock-offs are real, because they are perfect and immortal. These ideas will last forever even if our sensory realm is destroyed. Get it now? I’m dizzy! Aristotle was a Macedonian. He was a student in Plato’s Academy for almost 20 years. Aristotle disagreed with Plato’s theory that our reality is made of a realm of ideas and a realm of senses. He did not believe that our souls enter us at birth with a memory of perfect forms that are the molds for the cheap knock-offs we perceive with our senses. In contrast, Aristotle believed all of our ideas of the world are formed by our senses. Before we perceived things, we had no ideas. He invented formal logic, a specific way of reasoning to discover truth. We call his reasoning (figuring something out) deductive reasoning. In mathematical terms, it goes like this: A = B. B = C. Therefore, A = C. Or in regular English:Socrates is a man.All men are mortal.Therefore, Socrates is mortal. He was an avid scientist and categorized everything in the ancient world. Aristotle is the reason we classify modern humans as Homo sapiens sapiens. He invented much of our modern sciences. His influence was so great that all his ideas were accepted as fact until Galileo refuted some of them. Even in his day, Aristotle was recognized as one of the wisest men in the world. As you know, he was the tutor of Alexander the Great. After Alexander left for his campaigns, Aristotle returned to Athens and founded his own school of philosophy and science called the Lyceum. Astronomers in Babylon were the 1st to philosophize about the universe, the world, and people’s place in the universe.